When fighting the battles in Grand Tactician: The Civil War (1861-1865), you will face an enemy ran by a multi-layer AI opponent. In to-day’s Engineer Corps logbook entry we’ll talk a bit about the AI, which you, as the player, can also utilize. Hint: Click the links in the text to open images &c.
A Few Ways to Create a Line of Battle. When we started drafting the concept for the battle AI, we had in the background Oliver’s The Seven Years War (1756-1763) and its battle AI. In that title, the battle line for the AI was created by determining player’s army’s flanks, and line center. The AI would then match this line, deploying his troops accordingly. Depending on mission, the AI would try to out-power or out-flank player with its units. Though it sounds very simple, the end result was quite good and true to period. For example, if player started to turn a flank, the AI would counter by turning his line accordingly. In many battles I played, the end result was the battle lines rotating around each other, just like happened in many historical battles. But when we jump from times of Frederick the Great to American Civil War, we can see a few important development steps in tactics, which required some more thinking in the AI concept. Armies had grown larger since The Seven Years’ War, which required more robust organization. Corps organization allowed independently moving masses of troops with their own logistical support, so the whole army did no longer need to be together. Napoleon’s maxim “march divided, fight united” and identification of interior and exterior lines, as explained by Jomini, meant the battle lines would seldom be straight, and turning the flanks would be the norm instead of oblique order attacks, like favored by Frederick. With improved communication methods, the large bodies of troops were also easier to maneuver efficiently, which again increased flexibility. Due to the above facts, we decided, at least partially, to abandon the simple matching of lines mechanism, and went deeper with an AI that would have different levels according to organization and maneuvers. The top level of Grand Tactician’s battle AI is the army. On this level, the army commander decides the strategy the army will follow, and will give orders to “AI groups”, which are explained later. The Army commander will calculate known facts like the size and combat efficiency of the opposing armies (morale, experience, casualties, &c.), as well as troops arriving later as reinforcements. Depending on his personal attributes, he will decide whether to try to break the enemy line in an assault, try to outmaneuver it in attack, to take up defensive positions, or to withdraw from the field. The commanders also follow how the battle develops, and change the strategy accordingly – though with a delay. As personal and army attributes other than simple number of men is taken into account, it is possible to have a smaller but more aggressive army to take the initiative by attacking, or to force a numerically superior opponent to cede the battle-field by inflicting serious enough casualties to unease the commander-in-chief. Just like happened during the Peninsula Campaign in 1862 between Lee and McClellan. Under the army level, we have something we call “AI groups”. These are usually corps and division level organizations, or a number of them, that carry out the actual maneuvers. An AI group will maneuver on a “line of operation”, as described at that time, and will fight united as a “line of battle”. To describe this in historical context, one can see how the Battle of Wilderness in 1864 was fought: On May 6th on the Union side you clearly have 3 separate lines of battle, Sedgwick and Warren in the north, Burnside in the middle and Hancock in the south. In Grand Tactician this would be 3 different AI groups. The AI groups are formed so, that there will be a main unit, a corps for example, around which the rest of the group is built. More units can be added to the line, on right or left, to reserve behind the main unit, or in front or flanks to screen the movement. Additional units will follow the movement of the main unit, and are considered “linked” with it. They will do their best to maintain formation. 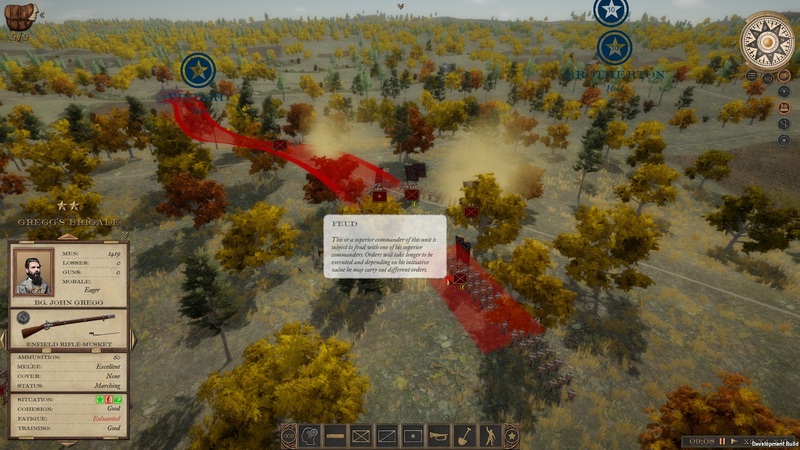 When fighting on the offensive, the AI group will try to turn non-anchored flanks of the opposing line, or if impossible, to break the line by assaulting. On the defensive, flanking maneuvers are met with refusing the threatened flank, curving and reinforcing the line. When AI groups arriving on the battle-field from opposing directions meet, they are combined into a larger body, and so on. The larger unit(s) within an AI group will be given a stance, or tactic, according to strategy, situation and position in the formation. The stance, which player can also give to his commanders in a battle, dictates how the commanders will use their single units, the brigades, artillery, &c. The stance can be to screen, to defend, attack or assault, and the used formation, tactics and maneuvers change accordingly. The Brigades Did the Fighting. The actual fighting is carried out by what we call the “micro-AI”, or the single unit level AI. This AI carries out orders that they receive within an AI group, and it also reacts to threats independently. This AI is the brigade commanders and such, who lead their men into thick of the battle, with no clear image of the bigger picture. The Micro-AI is also coupled with path-finding, navigating the battle-field to where he is ordered to. Micro-AI actions include, for example, stopping to fight an enemy, changing formation, advancing or falling back under fire, charging a weak opponent or maybe taking cover behind a stone wall or laying down to avoid artillery fire. The division and corps commanders and their staff also are controlled by this AI. Player will not be able to micromanage the movements of the commanders himself, as they will find their own place in the formation according to situation and threats. …but not in every case. The different commanders in Grand Tactician have different personalities, and like in reality, not all personalities work well together. Famous and experienced commanders have the highest probability for friction with completely different kinds of personalities. The friction could end up in open feuds, and this will complicate the line of command. The end result could be disagreeing with orders, delaying carrying out orders, or even acting on one’s own. This makes officer management even more important during the campaign, but also adds some extra realism: The Civil War was full of personal feuds that had an impact on the battle-field! In Addition to Whiskey, an Army Never Runs Out of Paper. 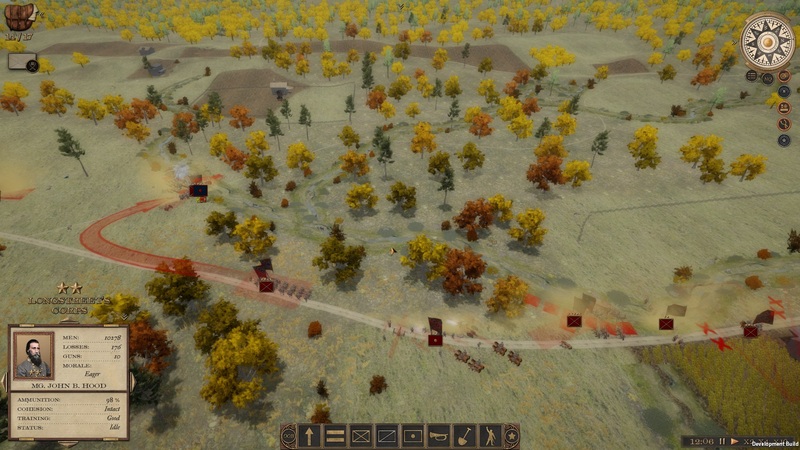 When playing the battles in Grand Tactician: The Civil War (1861-1865), even though the game pace is not hectic, the player will not be able to follow every single corner of the action. 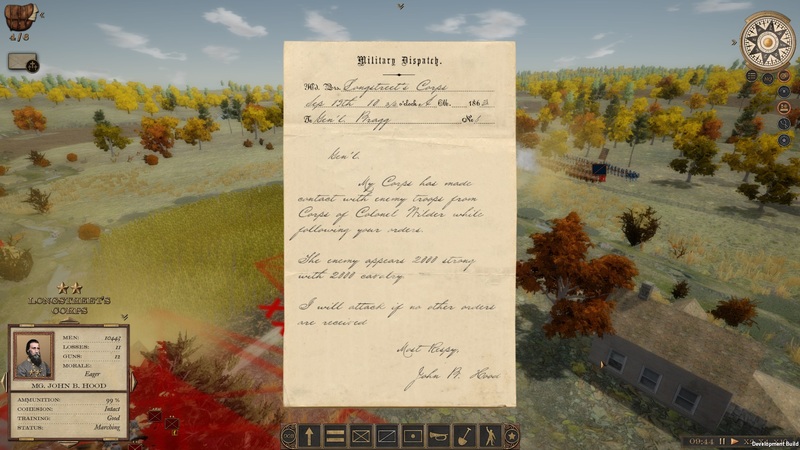 To help, the game offers a collection of papers to inform about important development in the front, or to give an overview of the situation and status of the troops. Wasel, our paper, map and typography specialist, web designer, musician, &c. is the man behind the historically inspired papers you will see in the game. The first paper presented to you, when starting a battle, is the map. Instead of a traditional minimap you see in most games, we decided to go for a full screen map, drawn in historical style, showing the overall situation of the battle. 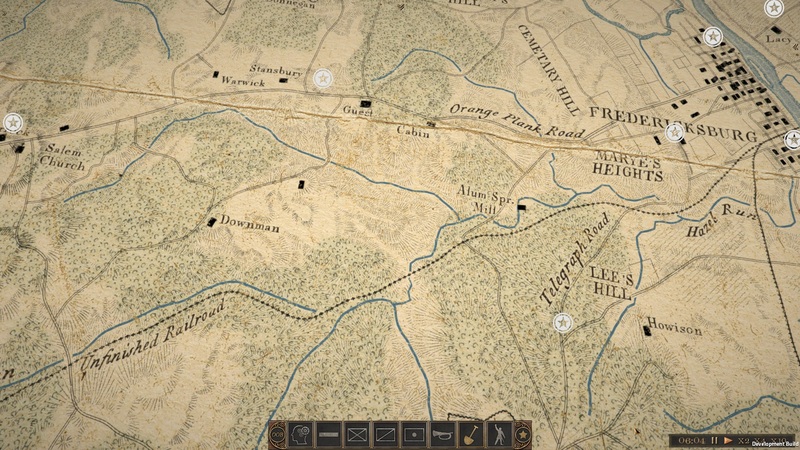 The map style is hand drawn by Wasel Arar, drawing inspiration from the maps Civil War generals had available, usually drawn by the engineer officers under their command. Our digital paper map is cunningly layered with hand drawn elements like wear and tear, the legends &c., but also contains dynamically changing elements like battle information, the units and so on. Some ahistorical choices needed to be made, for example because for game play reasons we need to show commanders’ position on map, which was not done in the historical maps. Here we chose to use commonly understood Nato -symbols. When entering the Headquarters -view during a battle, you can browse through the most important papers, that the ever busy staff officers have prepared for you. 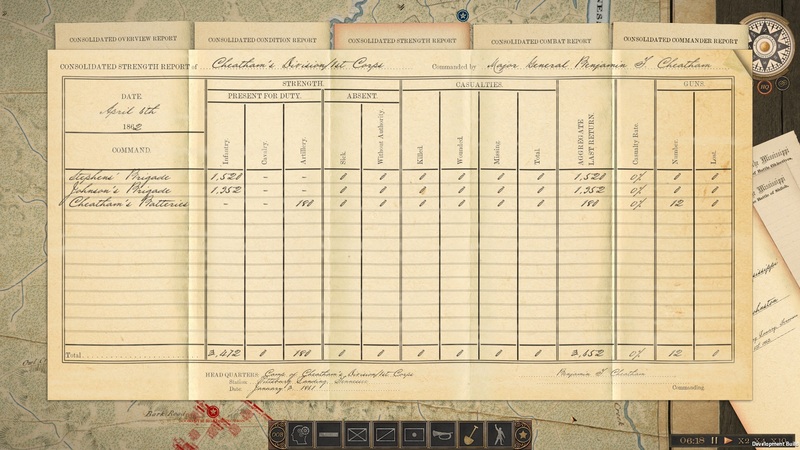 The game’s consolidated report forms, the large folded ones, look just like the consolidated morning report the staff would have made during the Civil War for their commander. The Excel of its time, the report will keep track of everything from service history to breakdown of strength of the units, to victories in combat and ranking within the army. How many men have deserted or have fallen sick? And who is your most experienced commander? Look no further. 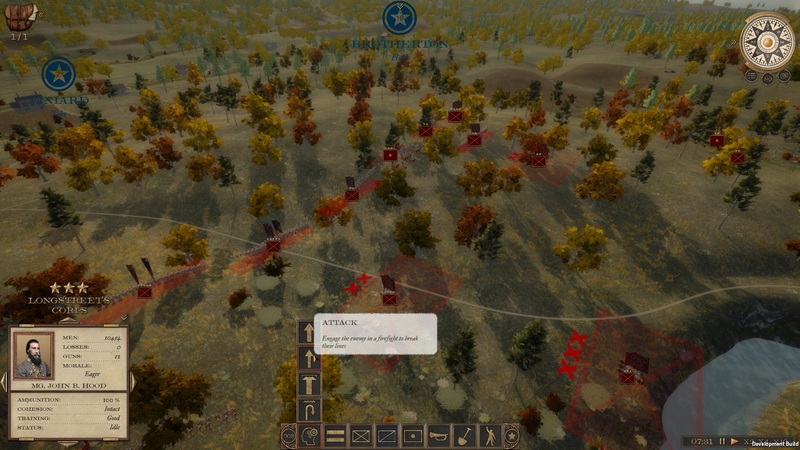 Player can browse the order of battle in the reports, from army overview to single brigades. In the headquarters the staff also keeps copies of briefings, as well as the battle field objectives and their status. One noticeable detail is how good the hand writing of the officers was, before the type writer and modern ruggerized computers! When creating the forms, we used real forms as reference, from the condition and look of the paper to fonts. 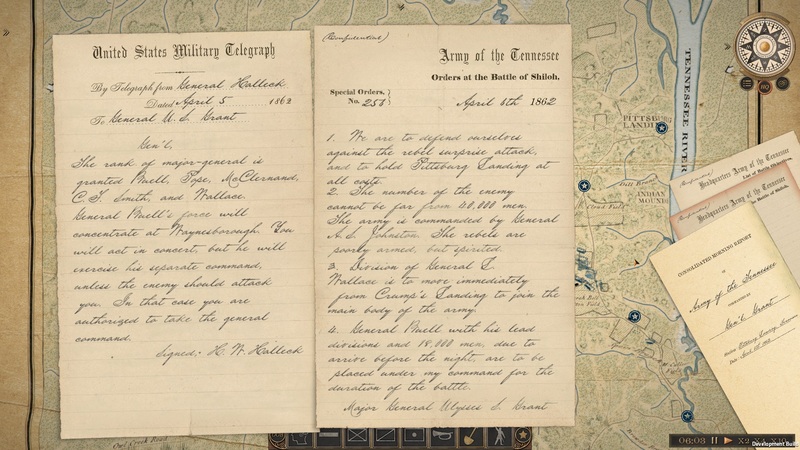 Some of the telegrams you will see, are those really received by the generals during the war. When going through The War of the Rebellion: A Compilation of the Official Records of the Union and Confederate Armies – Correspondence I have also learned quite a lot about how words were used differently back then – and then portray this in the papers you will see in the game to-day. With your army fighting in the battle field, it’s important to know the latest information about the situation of your subordinates. As the player cannot be everywhere, we decided to teach the AI commanders to send short dispatches when something of note happens. Whether they capture an objective, run into contact with an enemy, or run low on ammunition, a messenger will deliver the information to you to review. The dispatches are also stored during the battle, so you can backtrack the development of the situation later, if needed. The dispatch form used, when creating the messages, was: J.E.B. Stuart’s dispatch to Braxton Bragg on May 11th, 1864. 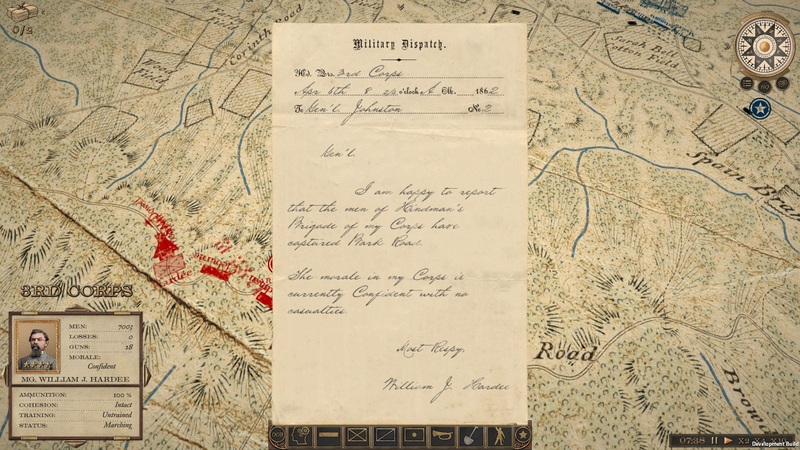 These papers are some of the small details our talented artists are adding in the game to capture the Civil War -atmosphere. We hope they will help immerse You, the player, to enjoy the game even more. In Grand Tactician: The Civil War (1861-1865) we are using a wide variety of sounds and music, that was heard on the 19th century battle field. 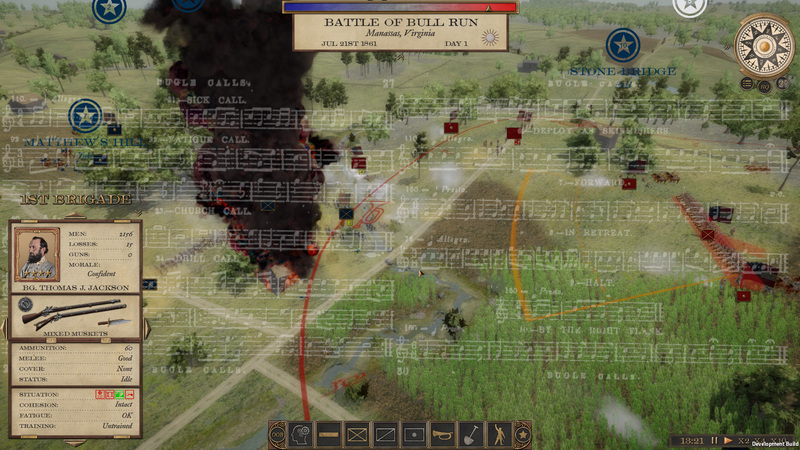 As a small independent team of developers, creating a believable world of sounds is challenging, but with help from very talented professional volunteers and some ingenuity, the sound of a 19th century battle field is coming to life. When playing the battles in The Civil War (1861-1865) first you will hear the marching sounds of the formations of troops, the clanking of artillery being towed to position and flapping of the flags in wind. While marching, the musicians in the brigade occasionally play drum and fife music to cheer up the boys, including catchy tunes like Bonnie Blue Flag or Frog in the Well. Creating these sounds required some field time and marching drills equipped with microphones. Some fellow joggers did look a bit curious when they ran past my “recording studio”, marching up and down a gravel lane, mud and puddles, 110 steps per minute – the quick time marching cadence used by troops in the Civil War. The same drills were carried out with double quick time and running. With some audio editing trickery, these drills were transformed into formation of hundreds men marching – and the artillery limber wheels rolling were originally a stroller, where the “artillery crew” was having her nap. The drum and fife recordings are played by Wasel and his crew. A reenactment drummer, Wasel knows how the instruments should sound, and also the troops that would have played them. Getting the sound right required some practice in imperfection. March to the Sound of the Guns. Once the troops get in contact with the enemy, a roar of musketry will take over, with the booms and bangs of artillery firing and shells exploding around the formations. The troops would shout and cheer anxiously, while performing their duties under fire. When we started creating the sound engine, we wanted to add the effect of distance to it. The sounds that travel long distances – firing of muskets, guns, shell explosions – sound very different depending on how far the source is. So, for these sounds we added a distance that changes the played sounds from clear shots and cracks to low booming and popping. Also the time the sound takes to travel is taken into account. To get the weapon sounds right, we used reenactment videos for reference, adding some “oomph”, as the weapon sounds a bit different when firing live ammunition. In the maelstrom of battle, directing the troops is difficult. The officers’ shouts of orders are not heard through the constant fire. Before the radio was invented, musical instruments were used to carry orders, as were couriers and messengers, and during Civil War wig-wag flags and field telegraph. The instrument used during the Civil War was bugle. The use of drums for this purpose was already in the past, as bugle sound cuts through the noise and carries farther. The kind people at National Field Music School gave us historical advice about the use of instruments in the battle field – thanks Don! 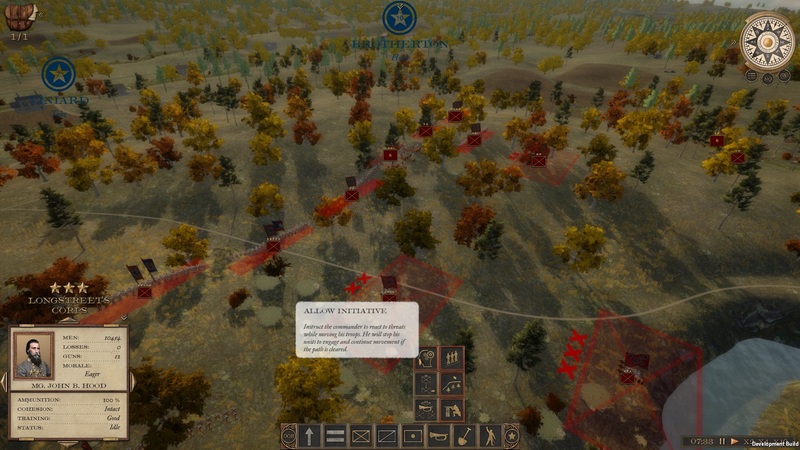 During the summer we have been working on the AI for Grand Tactician: The Civil War (1861-1865) battles, and Peter upgraded the artistic looks of the battle UI. The battle layer is soon fully implemented, and focus is turning to the campaign game play and features. Before diving into what the campaign will bring, we will release some more information about the battles, including more game play footage. As the Firing Dies Down. …And of course some disheartened soldiers will see the darkness as the perfect distraction to leave the ranks without permission and head home. Untrained, inexperienced, poorly lead and demoralized soldiers are the most likely lot to desert. In the heavy fighting your troops will consume their ammunition, which is in average some 60 rounds per infantry man and some 128 rounds for guns of average caliber. During the night, the troops will first level ammunition within their unit. Then they await the arrival of their supply train. Units with line of communication will be resupplied with ammunition and food, which is provisions for men and forage for horses. The amount depends on available supply, distance and also commanders’ administration capabilities. The supplies are distributed to the troops according to order of battle. Cut off troops will not be able to receive any supplies and this may cause problems with morale and condition of troops on the long run, in addition to not having more ammunition to fight with. If condition of men goes down, they will tire faster and the number of men falling sick will increase, along with the obvious effects on morale, that are the more severe the greener the men. After resupplying the commanders will be busy re-deploying their troops. The possible deployment zone is calculated from position of troops, occupied entry points and objectives. Troops cut off will not be able to reform, and will start their next day from the position they hold. During the night positions can also be improved with engineers building barricades and digging trenches. And of course the generals will consider the situation and formulate plans for the next day, to overcome the enemy. Or if the situation looks dire, maybe try to slip away and withdraw from the field to fight another day. Engineers at work. From Hardtack and Coffee. 1) When will the game be released? Currently we do not have a release date, or even a candidate, as the development is still ongoing and we’re deep in pre-alpha stage. Writing this, we are reaching the final battle features, before moving on to the campaign layer. Our aim is during 2019. 2) Is there a Kickstarter campaign or similar? No, we don’t have such campaigns at the moment, and none planned, at least for now. Currently, the biggest challenges we face are time related, as we all got our day jobs, studies, and families to attend to as well. 3) Will there be a multiplayer option? Not at release. We have not ruled out the possibility to include this post-release. Going from single player game development to multiplayer is a world on its own, and if we take that route, we’d like to do it properly with time. 4) Do you need testers or other help? Right now, we are quite comfortable with the staffing we got. The need for testers will become relevant closer to release, and we will of course let you know! Before that though, there will be a couple of features where we would require some help with – and then we will reach out with more specific information. 5) What scenarios / battles will be included? The details are not yet finalized, but the game will cover the whole war. Campaign will have certain starting points (scenarios) in addition to the full campaign. There will also be historical battles from throughout the war, but details about these will follow later. 6) The game is real time strategy game. Why, and what does this mean in practice? We have chosen real time game mechanics because of realism. While We-go and Turn based games are also enjoyable for us, these approaches simplify the core elements of warfare, space and time, too much in our opinion. So as the Grand Tactician, you will also have the challenges created from time running constantly. But: When we say “real time”, we don’t mean a turbo boosted click-fest. On the contrary, the game will be quite slow paced. 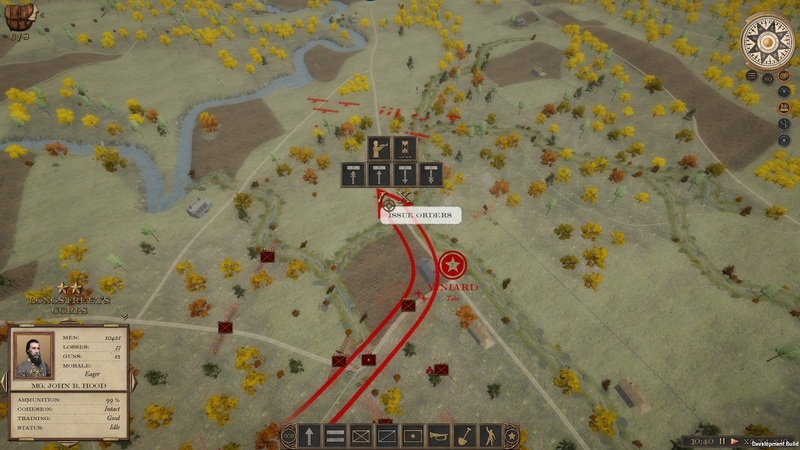 This is because of the realism approach, which includes features such as realistic order delays on campaign map and battles. So having quick reactions will not most likely help you as much as proper thinking and forethought. Your job as the Grand Tactician is to think ahead, and give well thought out orders to your sub-ordinates, who will be better equipped to handle the quick reactions as situation requires, according to your instructions. The game can be paused and accelerated at any time if the player wishes so. 7) The units shown in screenshots and video don’t look very detailed. What’s up with that? Will there be 3D units etc.? In Grand Tactician we have chosen to portray the battles with proper sized armies and with a good overview of what is happening. This allows the player to follow the battle better, but creates performance issues with the amount of troops shown. This comes down to VRAM and the size and amount of sprite tables. We tried lo-poly 3D models too, but the hit on performance was too much. But we will try to improve every aspect of the game before release, and this includes also visuals! 8) What are the main differences to other similar titles, like Total War, Scourge of War, HistWar, or Ultimate General? - The general approach: we are not aiming at breathtaking visuals, stunning action or beer and pretzels game play. Instead, we try to make everything with realism in mind – not forgetting the player’s ability to handle the information. This means for example, that the battles will not be over in few minutes. And that the campaign will not be a simple rush to build more and better troops and then steamrolling the U.S. We imagine the player, the Grand Tactician, not in a hurry, whacking his mouse like a maniac. Instead, we see him/her sitting back, maybe a coffee mug in hand, scratching his/her forehead about the next move he/she should do. - There will be not only battles or only campaign, but both. And these will be intertwined more closely than in other similar titles. We are aiming for a comprehensive game about the Civil War, telling the story of the war in a different way it has been done in computer games before. 9) What kind of DLC or Sequel plans do you have? We planned Grand Tactician to be a game series, and have been tossing around a few ideas about possible other conflicts to cover. But currently focus is 100% on the Civil War. We do plan on making this one as good as we can, and this includes plans to implement new features that simply cannot make it for initial release, in patches post-release. 10) The French in one of the old screenshots… What about them?